The Los Angeles teachers' strike is a model for a popular, militant working-class movement advancing a broad vision of education justice. That model can be replicated everywhere. Exactly one week after the United Teachers Los Angeles (UTLA) membership ratified an agreement that ended their first strike in three decades, the board of the Los Angeles Unified School District (LAUSD) met to vote on a resolution calling for a moratorium on charter expansion in the district while the state completes a study assessing their impact on the public system. That the school board would hold such a vote was one of the terms of the deal, but its outcome was far from certain. After all, this is a body that charter interests just two years ago spent almost $10 million to monopolize. For a time, that money seemed well spent. The charter backers held a 4-3 majority until a felony conspiracy charge related to his campaign forced school board president Ref Rodriguez to resign in disgrace last summer. But last Tuesday, with a few dozen students and others bussed in by the California Charter Schools Association watching, the remaining six members voted 5-1 in favor of the resolution. For eight to ten months, while the state investigates the issue, there won’t be any new charter schools in the district. The privatizers were not long ago on the march within LAUSD. Now, they are starting to bend to the demands of those committed to expanding public education. The story of how we got from there to here is a story of movement building — one with important lessons not just to Californians but anyone around the country fighting the decimation of public education in their communities. Countering the charter backers at the Tuesday school board meeting were several members of Eastside Padres Contra La Privatización, an all-volunteer organization that in 2017 formed in response to a planned KIPP co-location (in which an independent charter gets housed inside a public school, often displacing existing classrooms and programs) at Marianna Avenue Elementary in East Los Angeles. I spent the Friday night before the strike began with these parents and about fifty others, as well as a number of students, in a crowded room on the ninth floor of the UTLA building. These were ordinary people who knew they were a part of something big. Yet that something wasn’t abstract. Each was there for a very personal reason. All seemed to conclude that they could only address those immediate concerns together, by pursuing something larger. It felt like old-fashioned solidarity at its purest. The group, which appeared perfectly representative of the city’s demographics, had assembled to figure out strike support. How they were going to do that was an open question, but what they were fighting for hardly needed to be discussed. Mother after high schooler after grandparent raised hands to offer versions of the same answer: to defend public education, to demand increased state funding, and to fight privatization. They soon moved on to developing a plan, an important step since few among them had much if any activist experience. For the first week, they agreed to start each day on their neighborhood picket lines and to devote the afternoons to participating in workshops on the larger issues at stake in the struggle — racial justice, corporate power in education — and preparing for a series of direct actions targeting the forces behind the privatization agenda: from storming the offices of the private equity firm Oaktree Capital Management, whose senior executives bankroll the charter movement, to demonstrating outside the homes of charter-backed school board members like Monica Garcia and Superintendent Austin Beutner. The next weekend, five days into the strike, they went back to the drawing board to figure out how to escalate their campaign the following week. They had some big plans, but scrapped them in favor of a celebration once UTLA announced its settlement on the morning after Martin Luther King Day. All of this was dynamic, but none of it was spontaneous. That first Friday meeting had been organized by Reclaim Our Schools Los Angeles (ROS LA), a UTLA-supported coalition of community organizations like the Alliance of Californians for Community Empowerment (ACCE), the Los Angeles Alliance for a New Economy (LAANE), Clergy and Laity United for Economic Justice (CLUE), student groups, and various labor unions. And the work behind it went much further back. 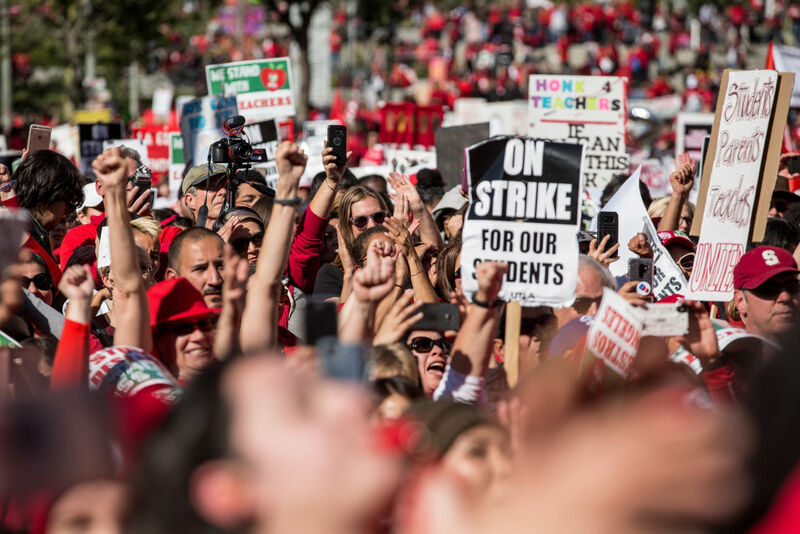 In 2014, UTLA began hiring full-time parent organizers who, together with ROS LA’s constituent organizations, have done the slow, rarely glamorous work of training parents and students about the threat privatization poses to traditional public education and preparing them to take that message back into their communities. The groundswell of popular support for the strike grew out of that organizing. Ten years ago, this kind of thing would have seemed unthinkable. From top to bottom, the Democratic Party was at that time committed to an idea of education reform that saw the problems with public school systems as starting and ending with bad teachers. The Obama administration’s Race to the Top program, overseen by Secretary of Education Arne Duncan, proceeded from the same kind of market idolatry that inspired George W. Bush’s No Child Left Behind — that struggling schools simply needed incentives to improve. “Choice,” “innovation,” and “performance” were the watchwords of the day, and charter expansion the solution. Hit pieces like the documentary Waiting for Superman shaped the liberal imagination of what was wrong and what was to be done, while droves of well-intentioned young people hoping to do their part (if also incidentally padding their law school applications) flocked to Teach for America. The full-blown commodification of public education seemed upon us. The first cracks in that juggernaut became visible when the Chicago Teachers Union went on strike in 2012. During that fight, the city’s entire political establishment, led by Mayor Rahm Emanuel, arrayed itself against the teachers. Yet the union still managed to win overwhelming community support, demonstrating the resonance that a message valorizing public education could achieve. Still, there’s a long way to go. This school board vote notwithstanding, the charter industry still holds much clout on that body. Moreover, curtailing the growth of charter schools will require a statewide legislative showdown, and you can be sure that the privatizers’ lobbyists will come to play. Newly elected California governor Gavin Newsom, who cruised to office with strong labor support, didn’t say much during the strike and has shown no sign of a willingness to expend political capital on this issue. To date, he’s been mum on the union’s proposed charter cap legislation. And, of course, no amount of discourse shifting affects the underlying economic reality of chronic school underfunding in California: the fifth-largest economy in the world spent less per-pupil than forty-two US states on the day the Los Angeles strike began, and they spent that much the day it ended. Repealing Proposition 13, the 1978 law that has effectively prevented the California public from reaping any benefit from galloping real-estate values, is a must. One can only imagine what the corporate class will bring to that fight. But if the road ahead is long, at least we now know where we’re going and how to get there: through a popular working-class movement advancing a vision that connects the futures of public school students to a well-funded, high-quality public education system. “It gives me so much pride to know that the kids and parents from my community are leading this struggle,” Garcia told me the day her daughter returned to school. That sense of ownership and the empowerment that comes with it is the source of this movement’s strength. And it’s something that can be replicated in every state across the country. Samir Sonti is a historian based in Los Angeles.